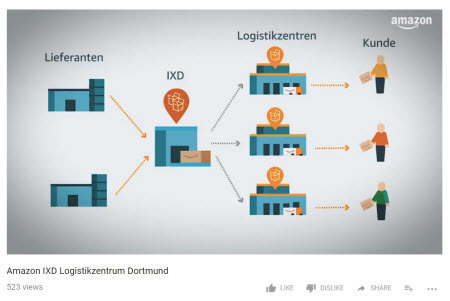 Amazon opened a state of the art logistics center in Germany, calling it its first “Inbound Cross Dock” distribution center (IXD) in Europe (redistribution centers in Amazon logistics parlance). Items come to the facility in Dortmund directly from suppliers and are distributed to other logistics centers throughout Europe within 24 hours. Amazon shared a video showing the massive size of the facility from the outside and the inside, where enormous robotic machinery does much of the heavy lifting alongside Amazon employees. In a blog post announcing the opening, Amazon said prominent representatives from politics and business attended the official opening in Dortmund, some of whom cited the jobs created by the opening. 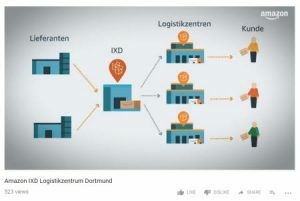 The facility is identified as DTM2 and features 13 km “Fördertechnik” (conveyor technology); 4 “vollautomatische systeme zur paketidentifizierung” (fully automated systems for package identification); 203 “Arbeitsstationen zur warenannahme” (workstations for receiving goods); and 360 grad roboterarme (360-degree robot arms). In a press release in January, Amazon said it had created more than 16,000 permanent jobs in the Amazon Offices, R&D centers, customer service centers, and logistics locations in Germany thusfar.